Bill Riddick’s life has changed a lot in the last month. But now, with the release of “The Best of Enemies” on April 5, moviegoers all over the country are becoming acquainted with two Durhamites — which Riddick, 33 at the time, helped bring together — who made history in 1971. 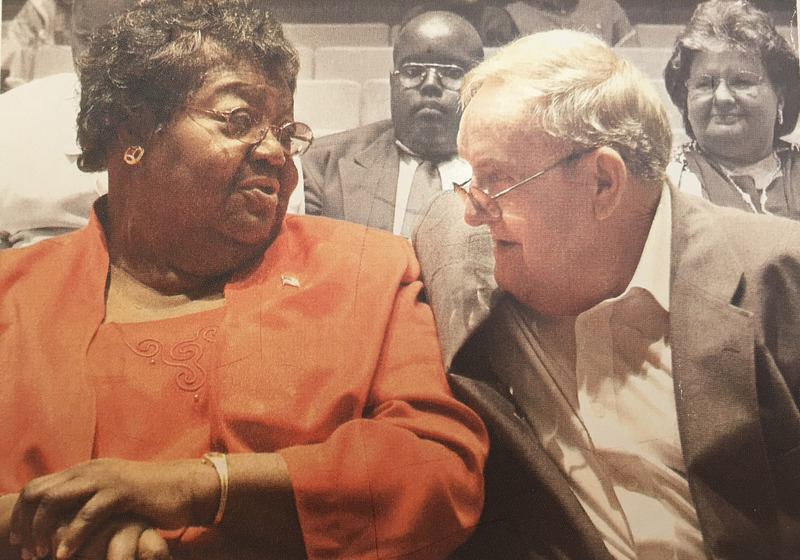 81-year-old Bill Riddick organized the charrette that brought Ann Atwater and C.P. Ellis together. Their friendship and impact on desegregated schools in Durham is depicted in “The Best of Enemies,” a new film released on April 5 (Staff photo by Jack Frederick). The major motion picture starring Taraji P. Henson and Sam Rockwell depicts the unlikely friendship that formed between the late C.P. Ellis and Ann Atwater out of an intense, 10-day series of SOS — Save Our Schools — community meetings called a charrette. Riddick facilitated the charrette, which decided, among other things, whether the community should fully desegregate its schools. He asked both Ellis and Atwater to be co-chairs for the charrette, because their leadership and connection to the problem made them prominent voices for each side. “Both had children in Durham City Schools who were not doing well, so they had the same issue there,” Riddick said. However, one thing set them apart from the other. Atwater was a no-nonsense black activist who hated all white people and wouldn’t take no for an answer. Her co-chair, Ellis, was an exalted cyclops in the local chapter of the Ku Klux Klan. At the start, both wanted a different result. And yet, out of that experience, the two famously became lifelong friends. After its first weekend at the box office, the film has grossed $4.5 million, according to Box Office Mojo. The premise of the story is something many critics said is unlike anything they’ve ever seen before. Though extraordinary, what took place 48 years ago was far from a story dreamed up by Hollywood. It really happened in Durham for real people who left a real impact on the area. While Ellis and Atwater both knew a Hollywood film about their story was in the works, neither lived long enough to see it on the big screen. Ellis died in 2005, while Atwater lived until 2016. Today, their influence inside and outside the events captured in the film continues to live on in Durham, even after they’re gone. Green always remembered Ellis and Atwater being good friends who referred to each other as brother and sister. They visited each other often and talked on the phone every day. Their families remained close, eating meals around the holidays and visiting each other during times of poor health. And when Ellis died, Atwater spoke at his funeral. The depth of their friendship was something many people remember most about the two. Today, Bloom is an adjunct assistant professor of health policy and management at the UNC Gillings School of Global Public Health. The new film is also based on the book, “The Best of Enemies,” written by Osha Gray Davison and published by UNC Press in 1996. Green could not understand the journey her grandmother and Ellis took at a young age, but she always knew the resolve Atwater lived by. Her grandmother never let anything get in her way. In the film, Atwater pulled the phone out of a city councilman’s hand in his office and hit him in the head with it because he wasn’t listening to her. That happened in real life and was just one of many examples of her reputation as someone who fiercely advocated for others in her community. Green saw this reputation first-hand when she got in trouble with a teacher in school. Green begged her teacher not to call her grandma, whom the teacher knew personally. “I knew what I was going to get when I got home,” Green laughed. Atwater attacked issues facing black people in Durham with the same stubbornness and resolve as she scolded bad behavior by her granddaughter at school. It was this kind of approach that put her at odds with Ellis as they rivaled one another to get their way in Durham public affairs. At city council meetings before the charrette, Ellis and Atwater would show up and argue their way, looking to accomplish the opposite of the other. It made sense that the Klansman and activist hated each other. Then, all of the sudden, the two had to spend hours at a time in close quarters to solve an issue important to both of them — education. Atwater and Ellis eventually tolerated this because they wanted the conditions of the Durham Public Schools to improve. They came to talk more, which was encouraged, and approached the other with more understanding than anger. At one point early on in the charrette, a couple of black teenagers tried to destroy Ellis’ KKK materials displayed outside the meeting room. Atwater stopped them, urging them to take home the materials so they could learn to understand the enemy instead of confiscating, destroying or vandalizing them. If the meeting was going to be a success, Atwater and Ellis needed to tolerate each other. In the process, they started confronting their own preconceived notions of the other. Before long, a friendship was budding. Vicki Lewis is still wrestling with the complex figure her father, C.P. Ellis, was. She has a lot to consider in the memory of him. When her mother got sick, Lewis used to find her father at the foot of the bed praying for her. Before and after leaving the KKK, he was a loving father who did everything he could for his family, Lewis said. For that reason, she tries to think of all the positives he brought, especially later in life. But she also has to consider, too, the impact of him leading white supremacists to wreak havoc and do awful things to people in Durham. He can never take those back, no matter how much his life changed later, Lewis said. Her father was a nuanced person with a complicated backstory. Lewis said when she was little, he used to take her to a restaurant in Durham run by a black man. But Ellis was also a leader, and a celebrated example, for a hate group that terrorized African Americans, among other groups. Lewis, who lives just across U.S. Highway 70 from where she grew up, said her father didn’t become heavily involved in the Klan until she was a teenager. They didn’t talk about it much, but being in the group gave him a sense of belonging and purpose. 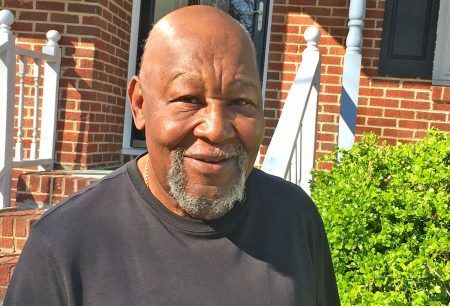 Lewis graduated from Southern High School — the same place Ann Atwater’s granddaughter Green would 35 years later — in 1967, getting out of the school system a few years before the charrette took place. Contrary to the movie, some schools were desegregated in Durham before the charrette. In Lewis’ senior year, two black girls desegregated Southern. But the mixing of white and black wasn’t mandated system-wide until a desegregation law was passed in 1970. Part of the 10-day meeting was reckoning with how the community could move forward after that. And Ellis joined onto the project and agreed to be co-chair with Atwater under the premise he could keep desegregation and integration away. His intention was to counter Atwater and everything she stood for, upholding white supremacy in the face of change in Durham. However, things didn’t quite turn out that way. After the charrette, Ellis put pen to paper and wrote a message to his family. A lot had changed in his life, and he had much to explain. Spoiler alert for the movie: On the last night of the charrette, the KKK leader stood before a packed crowd — including his Klan friends — and spoke. At the end of his speech, he pulled the Klan membership card out of his wallet and tore it in half. After all he’d heard and experienced, he thought it was better for Durham schools to be desegregated, and that meant denouncing the KKK. In a pre-screening at a movie theater in Raleigh, the crowd cheered as the card was being ripped up. It was just as shocking for those there in 1971. “The impact of him tearing up the card really floored me,” Riddick said. After supporting desegregation, something started changing in Ellis, Lewis said. He softened, and while he lost a lot of friends and endured a lonely period in his life, he’d gained a new one in Atwater. When the charrette was over, Ellis’ wife, Mary, took the rifle out of his car he used for Klan duties and buried it in the backyard, according to Bloom. Later, she poured concrete over top of it to make sure it wasn’t ever retrievable. Ellis stopped living like a Klansman and started living like a friend to Atwater. The two kept up that bond as Atwater continued community action programs and other activism, while Ellis eventually went on to organize labor unions at Duke University. Bloom sees the example Atwater and Ellis set as just the reminder we need today, in a politically and socially divisive era. The story of Ellis and Atwater isn’t just a story from Durham’s past, it bodes a lesson for the future. At the end of the movie, Ellis and Atwater are heralded for bringing the end of school segregation in Durham. But that just isn’t true anymore. According to a 2016 study from the North Carolina Justice Center, North Carolina schools have become resegregated in the last several years. While Durham’s public school racial distribution has improved slightly over the last 10 years, according to the study, all 10 of the largest school districts — including Durham Public Schools — have become more segregated by income. That means students from higher socioeconomic background have left behind public schools for charter schools — and charter schools skew much more white than public — while leaving behind lower income students with less funding and resources. The study of education in the state found that 72 percent of counties with at least one charter school have increased the degree of racial segregation in that district. While Durham County is about 50 percent white and 50 percent people of color, that racial breakdown no longer matches many local schools. Atwater and Ellis aren’t here anymore. But the example they set — which has become even more famous with the film — portrays the hard work it takes to not only change the education system, but sustain that change into the future. A video interview with Bill Riddick, who organized the 1971 charrette. By Adrianne Cleven, staff photographer-writer. Jack Frederick, a UNC-CH senior majoring in journalism and American History, is from Lumberton. This semester he is serving as the sports editor of the Durham VOICE. This entry was posted in Community-building, History. Bookmark the permalink. Good article about a great pair of people. The book Ann-Nakia mentioned is also titled “The Best of Enemies,” which I wrote in 1996, and is published by UNC Press. If we failed to give you credit for that, we’ll fix it asap. And congratulations, by the way.